The end of the European dream? 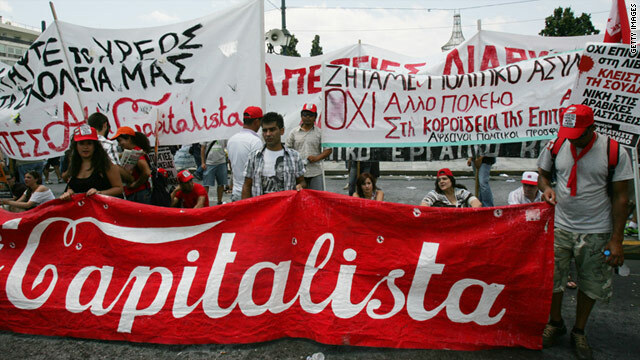 Demonstrations outside the Greek Parliament, Athens, on June 28, 2011. (CNN) -- The euro, a currency which binds 17 European economies, was designed to encourage trade and financial stability. But now its future -- and the stability of member nations --- is being called into question as a deep debt crisis exposes serious flaws in the foundations on which the bloc was built more than 10 years ago. As protesters vented their fury on the streets of Athens, Greece -- the bloc's sickest member --- politicians narrowly voted in favour of an austerity package allowing the country to draw more emergency loans from the International Monetary Fund and its eurozone peers. Despite the vote in favour, which should enable the country to avoid defaulting on its debt for the next three months, questions about the eurozone's viability and long-term future are growing. Legendary financier George Soros, speaking at the Institute for Human Sciences in Vienna, said it was "probably inevitable" that highly-indebted countries would leave the common currency. Soros, who made an estimated $1 billion in a 1992 by correctly speculating that Britain would have to devalue the pound, reportedly said: "We are on the verge of an economic collapse which starts, let's say, in Greece. The financial system remains extremely vulnerable." Authorities needed to recognise the bloc's "fundamental flaws," he added. The exit of a eurozone member would be devastating, economists say. Greek austerity vote passes: What now? For a country like Greece, it would mean the return to the Drachma, higher import prices and the potential for hyperinflation. A default on its debt would force European banks to take a hit, potentially triggering a domino effect similar to that started by the collapse of Lehman Brothers in 2008. Those left behind would be forced to deal with repercussions including the loss of investors' confidence in the bloc that -- as recent history has shown -- could prove calamitous. And so the European dream appears hobbled. Most economists agree that long-term survival of the project will require greater economic and political integration. However, there seems little appetite for so-called convergence among member states. Alfredo Pastor, the former Spanish secretary of state for economic affairs and World Bank economist who is now economics professor at Barcelona's Navarra University's business school IESE, said: "The creation of a federal state seems to be the only workable, stable, tried-and-true political structure for Europe; unfortunately, not all member states see it that way." "I think the [European] project will continue: The alternatives look awful," he said. The euro was created as a goal in the Maastricht Treaty in 1992, and available as cash by 2002. The common currency structure created the world's largest trading power. Monetary policy was to be controlled by the European Central Bank, with a remit of setting interest rates and controlling inflation around 2% or below. But the bloc's political and fiscal integration was minimal -- the euro was not designed to create a United States of Europe. Instead, the Maastricht Treaty created specific conditions required for entry into the single currency. And so the problems started. Joachim Starbatty, professor emeritus in economics at the University of Tübingen, who unsuccessfully challenged the legality of the euro through Germany's constitutional court, said most of the bloc's member states fulfilled the criteria by "creative accounting." The eurozone "was first and above all a political project. The economic arguments were swept away by the politicians," he said. Gary Jenkins, head of fixed income research at Evolution Securities, said the structure may have worked if countries had played by the rules. "Whether it was the structure or non-adherence to the structure is a moot point." The eurozone's weaknesses were abruptly laid bare in 2009, when Greece admitted its deficit would be more than 12% of gross domestic product -- far higher than previous estimates and more than four times the requirements of entry. This revelation shone a light on structural flaws in the bloc, and triggered investors' flight from Greek debt, sucking cash from the country's coffers. The end result was a EUR110 billion bail-out for Greece from the International Monetary Fund and its eurozone partners. Turmoil followed as Ireland and Portugal admitted they also needed financial help. And Greece's sticking plaster has proved insufficient to stem the blood, with a second bail-out expected. While Greece's problems are country-specific -- the failure to collect tax, for one -- its problems have been exacerbated by a currency which shackles the weak to the strong, economists say. "The Greek crisis has been created by imprudent fiscal management by the previous Greek government," Pastor says. "It has become a serious crisis due to the eurozone structure. If Greece had been a province of a bigger federal state, no one would have noticed the crisis." Starbatty also points to the eurozone's low interest rates for encouraging excessive indebtedness, which in turn created the housing bubbles which have contributed to the crisis. Michael Haliassos, chair in macro-economics and finance at Goethe University, Frankfurt, signed an open letter to Greece this month pleading with it to implement "deep structural reforms." He offers this metaphor to describe the bloc: "If someone gives you a stone you can do two things with it. You can build a house or you can throw it at someone." The structure of the eurozone has also prevented it from dealing with unexpected risks such as manipulated data, the potential for a sovereign default and the collapse in value of a country's debt and subsequent impact on the banking sector, according to Daniel Gros, director of economic policy at Brussels-based policy think tank The Centre for European Policy Studies. And so the financial crisis rolls on, throwing into sharp contrast the eurozone's effective two--tiered structure in which weak countries such as Greece, Ireland and Portugal are financially supported by the strong, such as Germany and France. A transfer of funds, and risk, is being channelled through the eurozone's temporary bail-out fund -- the European Financial Stability Facility -- which is due to be replaced by a permanent fund, the European Stability Mechanism, in 2013. Observers agree the financial meltdown may drive changes to the structure of the eurozone. While a push toward full unification may prove unpalatable, they float other options such as raising funds as a bloc, and more centralized banking and tax collection services. The bloc is being dragged toward closer fiscal unity "kicking and screaming," Jenkins said. One option would be to introduce a temporary fiscal union -- maybe for five years -- allowing the bloc to raise funds centrally, he said. But for Starbatty, the European vision remains. "For me the European dream is a community of democratic countries united in freedom and solidarity. The politicians destroy ... this Europe by ruining the economies of the periphery states and their own finances." CNN takes a look at the key moments of the Greek financial crisis, from eurozone accession to recent protests and austerity measures. Fourteen EU countries had public debt exceeding 60% of their GDP at the end of 2010, according to official statistics. Q&A: Will Greece exit the euro? Experts are divided over whether Greece could leave the single European currency, but the consequences would be significant. As the European debt crisis appears to be coming to a head again, here are five key issues to keep an eye on. Can Europe get out of trouble? CNN's Max Foster talks to economist Joseph Stiglitz about the financial crisis in Europe and what needs to be done. Can China come to Italy's aid? In a bid to stave off a default, Europe's third-largest economy is calling out to China for help. As Greece falls, many are wondering how the rest of the European sovereign debt crisis will play out.